An influential article this month argues that real estate has become so superheated by investment capital that one city, New York, has become completely disconnected from human reality. Can Seattle be far behind? The latest signpost pointing to our city’s shiny future — or bleak destiny, depending on where you stand — is taking shape in South Lake Union directly across from my office. I’ve never seen it, though. And based on the cheapskate crowd of reporters and nonprofit types I tend to hang out with, I probably never will. It’s up in the sky, a $19,000 apartment. I don’t mean per year — the advertised rent is $19,000 per month. Actually $19,265. Though up in air that thin, it’s hard to see why they bothered tacking on the $265. But regardless, the inflation in luxury living is remarkable. 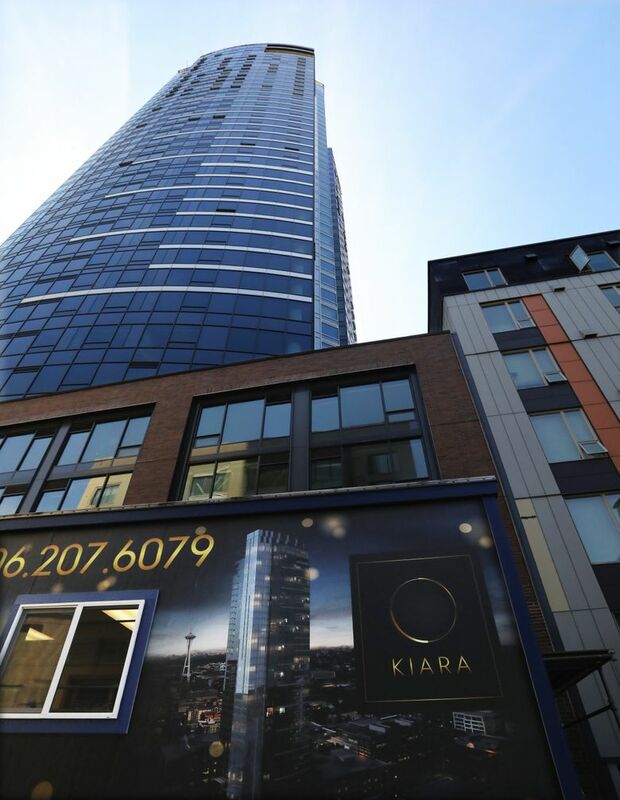 Just three years ago, the most expensive apartment on the market in Seattle was $6,800 a month, for one of the units in the Belltown luxury building Escala. Recently a penthouse on top of One Lincoln Tower in Bellevue was going for $20,000 a month, but at more than 4,000 square feet it’s a third larger than the apartment at the under construction Kiara building. Unit 4009 is a 3,000-square foot penthouse in one of those 41-story towers sprouting like bamboo in the Amazon jungle. From the outside the building has all the style of an ’80s office tower. But inside it promises sky lounges, an “elevated oasis … with meandering paths,” concierge services and Instagram-able views. “We’re not just renting apartments. We’re building a community,” says the Kiara promotional material. Jones, who was kind enough to explain to me how high-end rentals work, said there are three likely categories of renters who could be willing to pay nearly a quarter-million dollars a year in rent. One is the wealthy looking for a temporary in-city pad while they are “between houses.” Another could be a tech executive or high-level recruit taking Seattle’s temperature (“maybe they want to try one of our winters first, before committing.”) Three could be a corporation that plans to use the suite as a recruiting tool. This sounds to me less like community and more like the arrival in Seattle of a phenomenon just chronicled with great angst in the July issue of Harper’s Magazine. “We are becoming a city of transients,” author Kevin Baker writes. The second trend is that Manhattan’s real estate is so superheated by investment capital that it is weirdly disconnecting from human reality. The article recounts finding “188 vacant storefronts along Broadway … this on a main commercial avenue in an incredibly wealthy city, in the eighth year of an economic expansion.” The value of the real estate is so stratospheric as an investment that the rent roll no longer matters. This was the germ of an idea I was trying to get at last year when I coined the term “prosperity bomb,” to describe what has hit Seattle. Those of us who were lucky enough to arrive here decades ago and buy a house have been showered with prosperity. While many who don’t own are being blasted out of town, including scores of small businesses. So here’s the question: Is it possible to square a $19,000 per month rent with “building a community?” Can they coexist? Or is extreme affluence a sort of benign virus that can only hollow out the diverse life of a city. I don’t know, but I guess the prosperity bomb is more like a neutron device. What’s guaranteed to thrive after it goes off isn’t the people. It’s the real estate.